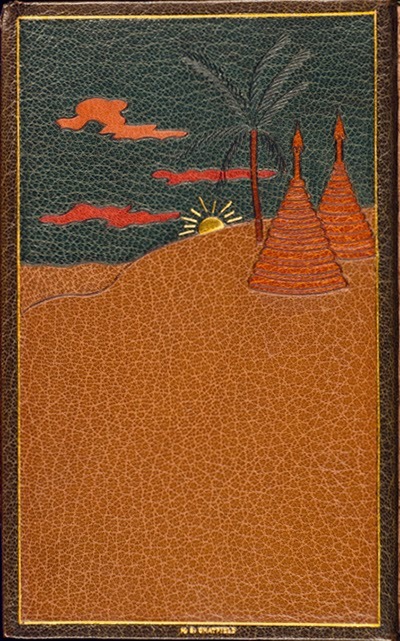 On Sunday morning, December 29, 1913, at 11:30AM the body of Mary Effingham Chatfield, 42, an art bookbinder with work commissioned by many of New York's most eminent book collectors and private libraries, was discovered flung across a couch in her studio on the sixth floor of 400 W. 23d Street in Manhattan, NYC. She had been stabbed with a long, slender paper cutter with keen edge and point. On a nearby table a blood-splattered note was found with the cryptic accusation, "Mrs. Howard is to blame for this." Close friends of Chatfield, who knew her as "Mollie," upon learning of her sudden, violent death and the strange note, presumed that she had been murdered. The bloody note indicated that Mollie had written it after being stabbed, then dragged herself to the couch where she soon died: the blade had pierced her heart. Her older brother, Harvey, who identified the body, knew otherwise. "I have not the slightest doubt that my sister committed suicide," he declared to reporters. "I do not know who the Mrs. Howard she referred to may have been for I do not remember any one of that name who has come into touch with our lives for at least five years." He then told of the bizarre circumstances which led to her death. Binding by Mary E. Chatfield. For the prior two months Mollie had been the victim of strange hallucinations, pursued by an inner voice that she believed to be that of a woman, one who commanded Chatfield to submit to her will and do what was demanded by her. In her desperation to escape the voice Mollie rented a studio on the top floor of her building in the hope that the voice could not reach her there. Chatfield, additionally, had taken to long, exhausting walks at rapid pace to elude the harridan's voice that constantly chased her. "It may have been that she believed that a Mrs. Howard was the woman who was following her wherever she went," her brother told a New York Times reporter. What prompted her snap? Mollie and Harvey had a sister, Elizabeth, who, a year prior, had become so stricken by tuberculosis that she was sent upstate to Saranac, then a world-renowned center for the treatment of TB. They were very close and Mollie had given up her work to accompany and help care for her sister, who was suffering and wasting away. The months which followed were difficult for Mollie and when Elizabeth died she experienced a nervous breakdown. By October of 1913, however, Mollie had made sufficient progress in her recovery to return to the city and begin work once again. She placed herself under the care of Dr.. John E. Wilson, a "nerve specialist" with an office at 616 Madison Avenue. Then the strange hallucinations began with the voice ordering her to do things she did not want to do. Her escape to the top floor and the frenetic walks around the city followed. Harvey Chatfield thought that Mollie had been making progress; he had taken her out to dinner on Christmas Eve and she appeared to be in good spirits. Her doctor was also encouraged. She was last seen alive at 7:30 Saturday night December 28th. Her body was discovered on the couch the next morning by a Mrs. Taylor, who had come to the studio with books she wished to have bound. After no response at the door the superintendent was called and Mrs. Taylor was let in and discovered the tragic scene. Mr. Chatfield said that Mollie's bindings were commissioned by respected book collectors such as Robert J. Colter. Mrs. Taylor, present at the time Harvey Chatfield was interviewed and, evidently, the soul of discretion, said she thought it best not to mention other prominent people who hired Mary E. Chatfield, who was known in New York's art community for many years. "Miss Chatfield's studio was one of the most artistically furnished of those in the big building. She had her workshop in the large front room into which the sunlight poured through a great skylight. An old spinning wheel stood in one corner, and the furniture included an antique desk of considerable value and an old mahogany piano. On the mantel was a pair of brass candle-sticks of unique design. A complete bookbinding outfit was neatly arranged on the work table beneath the skylight. Off this room was a smaller one, where Miss Chatfield had lived. She did her own cooking on a small gas range. Miss Chatfield was a member of an old Southern family, friends said. She was a handsome woman," (NY Times obituary). Upper doublure. Note Chatfield's stamped signature at bottom edge. The binding seen here is the only one by Mary E. Chatfield that I've thus far encountered. Curiously, no reference to her is found in Marianne Tidcombe's Women Bookbinders 1880-1920. It seems that she did not produce a large body of work; I have not found a single binding by her in any major library's online catalog. Yet with bindings by her in the collections of prominent collectors and libraries, as reported at her death, the books had to wind up somewhere. From a family of means, it may be that she was a dilettante in the Arts & Crafts movement, which, from its roots as an aesthetic protest against mechanization during the late 1880s-early 1890s, had, to a large degree, fallen into vocational work for the wealthy. Yet Chatfield was, reportedly, devoted to bookbinding, an unmarried woman of taste, means, and artistic yearning unsatisfied with the traditional, stultifying role: all dressed up with no place to go except shopping, the opera, and social occasions. For the wind is in the palm-trees.. The mystery that is Mary E. Chatfield demands solution. I encourage anyone with further information on her to contact me. Both the Mary Chatfield binding and the article are important excellent finds. I can add a little knowledge to what you have already. The story is a bit more obscure, though. 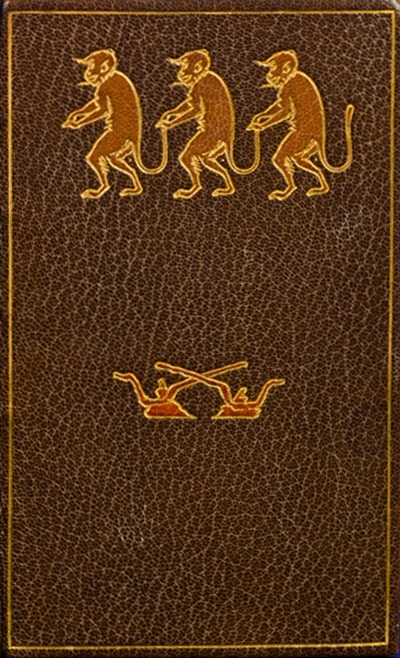 The Grangerized Kipling shown here has been published before, in an article of 1915-- one of two fine bindings attributed to "Harvy Chatfield." Mary's brother Harvey S. Chatfield also joined the GBW in 1906-1907, sharing a New York address with her (this was most likely a studio address), as a professional but without mentioning his teacher. He likewise missed 1907-1908, and reappeared in 1908-1909, sharing a new NYC address with Mary, and now claiming Dehertogh as his teacher. In 1909-1910 he added "Teacher" to his listing. He remained a member of the Guild until 1920-21, changing his listing only in address. Possibly brother and sister worked as a team, forwarder and finisher; or possibly this was a binding of Mary''s, completed by Harvey after her death. Finally there is Rose Farwell Chatfield-Taylor (Mrs. H.C.) of Chicago (b. 1870) who joined the GBW in 1906-1907 as a professional ("Rose Bindery") and as "Pupil of Rene Kieffer, Paris, France." The next year she listed herself as a teacher. She remained in the Guild without change to her listing through 1909-1910. 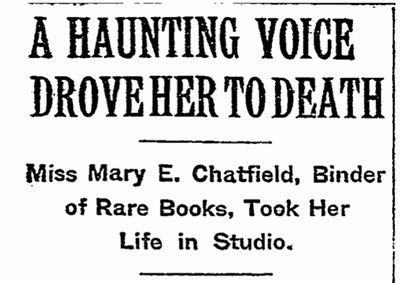 It is at least an interesting coincidence that Mary Chatfield's body was discovered by a "Mrs. Taylor." Perhaps genealogical research might uncover a connection. The Guild of Book Workers First Year Book and List of Members, 1906-1907. New York:The Guild of Book Workers, 1907. Annual, 1907-1946. Burleigh, G. "Some American Bindings and The Guild of Book Workers." Arts and Decoration 5 (May, 1915), p. 274-276. Header image from New York Times obituary December 30, 1913. 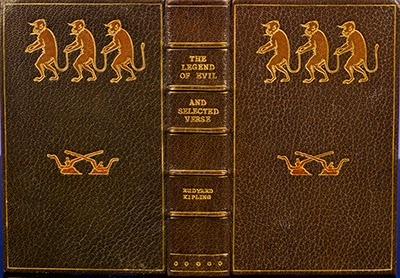 Binding images courtesy of David Brass Rare Books, with our thanks. Though it has nothing to do with bookbinding, you may be interested in Sidney Lawrence's Feb. 21 WSJ article, "Two Figures Shrouded in Mystery."